This postcard was sent home by William Henry Butcher, to his parents John William and Selina Bertha (nee Morley) at 46 Bridge Street, Doncaster. 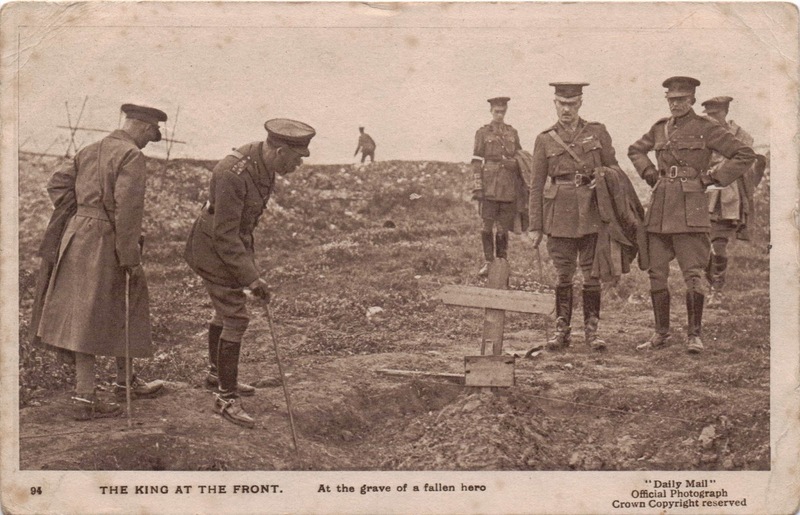 The front of the card shows King George V 'at the Front' and being 'at the grave of a fallen hero'. The card is one of an official series released by the Government showing various scenes at which to inspire the people at home to continue the support of the War; to help raise recruitment; to keep the morale of the troops in France and elsewhere high - as well as depicting that the head of state was also as much concerned about the efforts of those men in uniform. The card was passed by the censor (stamp No. 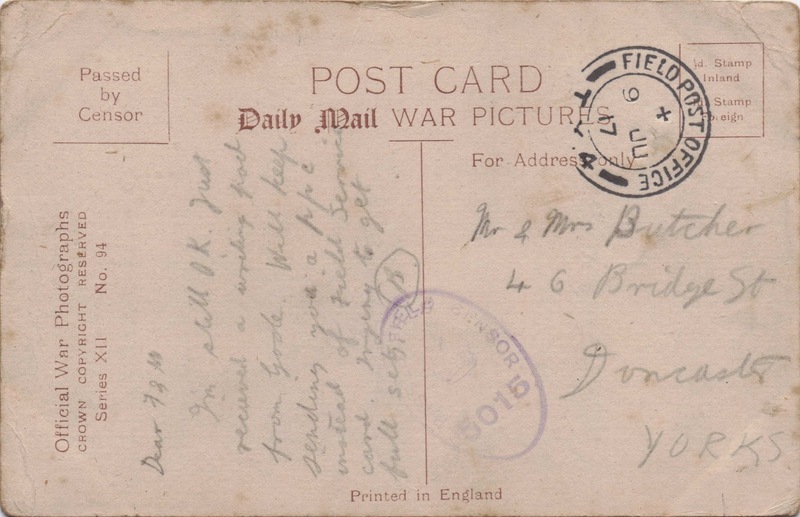 5015), and stamped by the Field Post Office on 9th July 1917. Billy' service record has either been lost, as a result of WW2 bombing, or is still held by the MoD on account of his service after the First World War but some details can be given from those records that are accessible. Billy was born on 15th April 1894 and in 1901 the family are living at 7 Gordon Street, Doncaster, with his father John William working for Doncaster Corporation as a waterman. Ten years later the family are still at the same address, with John now employed as a Tap Inspector at the Borough Council Water Works; Billy, now aged 16, being employed as a 'fettler' within an iron foundry at an electrical engineering firm. At this time John was aged 42 with his wife Selina being 40, the rest of the family being George (13); Annie (10); Ernest (6); Harold (3) and Ethel (1). When he enlists on 29th May 1915 in the Royal Field Artillery Billy was given the 'Territorial Force' number 786602, being assigned to 2/3 West Riding Brigade Royal Field Artillery. At some point he is transferred, being given the number 291143 - all this time his rank being 'Driver' (one of two men in charge of the horses, both when teamed up with gun and limber, and when the gun is in 'action'). On 11th March 1919 he is discharged from the Army, but on the following day at Catterick he re-enlists, again in the RFA, now aged 24 years and 10 months. His former trade is given as 'skilled labourer', with his father' address given as 46 Bridge Street, Doncaster. His number now being 1046730. At some time after the above date Billy is posted to Mesopotamia, and as a result of his 'good work' he is 'Mentioned in Despatches' - his name being printed in the London Gazette (Supplement 32452 pg.7179 dated 9th September 1921); his rank at this time is stated as 'Signaller'. On 31st March 1922 Billy is stationed at No. 3 Depot RFA, Hilsea, when he is discharged on account of the 'Termination of Service' under King's Regulations Para 392 (xxi). Now holding the rank of Bombardier, his conduct is noted as 'exemplary'. He gives his address upon discharge as 10 Flanderwell Villas, Bramley, Nr Rotherham. As a result of his service in France Billy is awarded the British War and Victory Medals, both bearing the rank of Driver and No. 291143. He is also awarded the General Service Medal, with the clasp denoting 'Iraq'. Billy married Alice Sturman in the late summer or early autumn of 1930. He died in 1974. On the postcard sent to his parents, Billy states that he received a writing-pad from Goole. It was probably from his Mother’s sister, his Aunt Agnes. Agnes Mary Morley was married to a boiler-maker named Arthur Atkinson. They were married in Doncaster in 1895 and shortly afterwards moved to Goole. They had a daughter Edith who was born in 1897. In 1901 Arthur and Agnes are residing at 8 Kingston Terrace, Goole; ten years later they are 'boarders' at 18 Heber Terrace, Old Goole. On the latter date Arthur is 35, with Agnes aged thirty-four. Edith, in 1911 is stated as being a drilling machine worker at a brass foundry in Doncaster, while living with her mother' parents, George and Mary Ann Morley, at 8 Wellington Street, Doncaster.